Aside from being one of the top universities in the world the University of Michigan and the surrounding Ann Arbor area go above and beyond for the further pursuit of education and knowledge. These five uncommonly discovered places on campus, full of unique qualities, expose the importance that is placed on students acquiring knowledge through a hands-on, see-with-your-own-eyes kind of teaching and learning. Not only do students use these venues for education, but are also undiscovered territory for visitors. Integrating knowledge, beauty, and rarity is grounds for those whom enjoy the unusual. Enjoy. The Skymaster ZKP 3/B. Photo courtesy of umich.edu. Angell Hall, located on central campus, is home to one of eight UM telescopes and the Angell Hall Planetarium. Michigan undergraduate Astronomy courses use the planetarium for class discussions and learning. However, the University has opened up the planetarium to the public during select Friday evening open houses. The Skymaster ZKP 3/B has been in operation since September 1, 2004, replacing a manual planetarium from 1957. Not only can you see 7,000 stars, the Milky Way, the Sun, the Moon phases, Mercury, Venus, Jupiter, Mars and Saturn- but you can display the sky as seen anywhere in the world at any given time. In addition, compressing time in order to see the change from the beginning and end of a day within a few minutes is a real strength of this specific planetarium. What better way to learn about the stars, moons, and planets then to actually observe them on a daily basis with your own eyes? The University of Michigan, literally, goes above and beyond with this one. Located at 435 South State Street. Students run tests in the MHL. Photo courtesy of umich.edu. If you have ever ventured out to sea on a cruise ship, or even a lake on a pontoon boat, you can appreciate the importance of Naval Architecture and Marine Engineering. The University of Michigan makes it a priority to effectively prepare their students for a successful career in Naval Architecture and Marine Engineering, accompanied by the best leadership and learning devices. That is why UM is host to the Marine Hydrodynamics Laboratory (MHL), which includes a Physical Modeling Basin used for resistance, sea keeping, propulsion testing and other tests. In this lab, cutting-edge research and model testing is practiced and produced. In addition, an introductory class to Engineering uses this facility to test their remote operated vehicles in the physical modeling basin. In particular, the University of Michigan owned Physical Modeling Basin was the first to be operated by an institution of education while also playing host to various industries and government sponsored research/testing programs. If you walk under the West Quad Arch you may be so lucky to catch a glimpse! 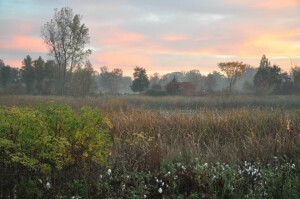 Fall sunset at Nichols Arboretum. Photo courtesy of facebook.com/mbgna. Nichols Arboretum, or more commonly known as the “Arb”, is nature at its best in Ann Arbor. Located on the eastern edge of central campus, the Arb is made up of various native and exotic trees, shrubs, and flowers. Not only is the Arb known for it’s breathtaking beauty, but students and locals gather to do various outdoor activities, as well as viewing performances and plays along the hillside. The Arb has three entrances of which the public can explore freely: Geddes Avenue, Washington Heights, and the River entry are all options open to enter the fantastical lands within. Located at 1610 Washington Hts., Ann Arbor, MI 48104. Gardens and trails open 7 days a week, sunrise to sunset. 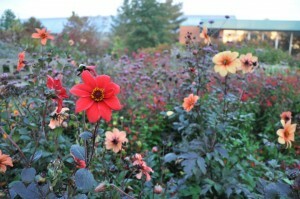 Flowers blooming at the Matthaei Botanical Garden. Photo courtesy of facebook.com/mbgna. Along with Nichols Arboretum, Matthaei Botanical Gardens are also a showcase of the extensive beauty located so near to campus. These gardens display a rich environment that includes Gaffield Children’s Garden, and a 10,000+ square foot conservatory, not to mention the trails for hikers and bikers. University of Michigan cherishes this inviting getaway as a dedication to the enrichment and understanding of the natural world through the enjoyment of it. Located at 1800 North Dixboro Road. Gardens and trails open 7 days a week, sunrise to sunset. Conservatory open Mon.-Tue. & Thurs.-Sun., 10am-4:30pm; Wed. 10am-8pm. Admission is free. Museum of Natural History and Zoology. Photo courtesy of blogspot.com @micharch. 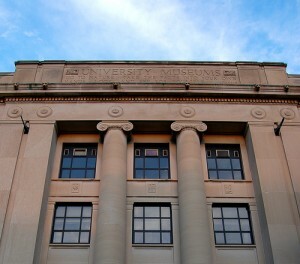 The University of Michigan is also known for having over 10 museums on campus and an expansive variety of museums at that. Although all attract thousands every year, the University of Michigan Museum of Zoology is possibly one of the most overlooked. Located within the Museum of Natural History, The Museum of Zoology is home to some of the finest zoological research collections in the entire world and acts as a crucial tangible in order to further study the primary ecosystems around the globe. The importance of this museum alone acts as a reason to visit or at the very least know about it. Located at 1109 Geddes Avenue. Open Mon.-Sat., 9am-5pm; Sun., 12pm-5pm. Admission to the museum is always free; however, a $5 donation is suggested. All five of these places, located on the University of Michigan’s campus, are uniquely devised and provided to the public as a tribute to what UM stands for. Accentuating the importance of education and allowing their students to see with their own eyes the product of their work and devotion. Of course, feel free to visit the above places on your free time in Ann Arbor or make an appointment! My name is Madelaine Moeke and I am a Junior at the University of Michigan-Ann Arbor. I am currently enrolled in the Sport Management program and am specifically interested in game-day operations within the professional leagues. Being involved in an industry that has both global importance and relevance is a compelling objective, and one of which I hope to further explore.